This book has been on my “to-read” shelf for ages and I finally got it from the library and read it. I was confident enough in it that I would’ve been willing to buy it without reading it, and my confidence was not misplaced. Set the year before A New Hope (year 01137), the plot follows a few prisoners — two boys, a couple of smugglers — one of the guards, and the medical officer of the Imperial prison ship Purge. It does indeed follow the standard zombie protocols — outbreak, infection, death — but I deny the accusations that the SW elements are merely “pasted on top.” True, it’s about a bunch of random characters, but enough takes place in the universe that we don’t always have to have main character adventures. It is, to my knowledge, the only adult SW horror book, and is a light read, perfect for the approaching summer months. Highly recommended! 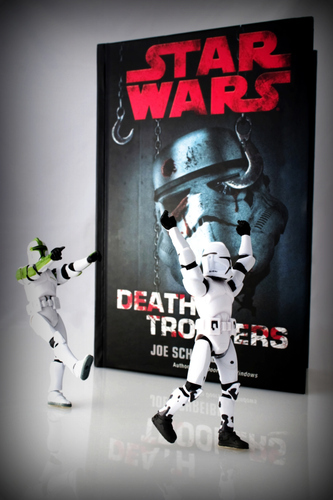 This entry was posted on 17 June 2011 at 5:43 PM and is filed under Reviews, Spotlight with tags books, expanded universe, horror, Joe Schreiber, star wars canon. You can follow any responses to this entry through the RSS 2.0 feed. You can leave a response, or trackback from your own site. This sounds like an enjoyable read. My “to-read” list is reaching preposterous proportions, but I may let this one shoot up towards the top.